Robert J. Bojdak is an Executive Vice President and Chief Credit Officer at M&T Bank, where he heads the Credit Division. 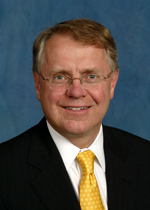 Bojdak also serves as a member of M&T Bank’s Management Committee and Co-Chairman of the bank’s Senior Loan Committee. As the Chief Credit Officer, Bojdak is responsible for the bank’s Credit Risk Management Division, which includes commercial underwriting and approval, credit administration, retail and commercial portfolio analytics, credit risk rating methodologies, counterparty risk, and problem loan management. Bojdak joined M&T Bank as Deputy Credit Officer for the Pennsylvania region in April 2002, and was promoted to Executive Vice President and Chief Credit Officer in June 2004. He has 37 years of banking experience, including regional credit and sales executive positions from 1992 to 2002 with KeyBank, and in credit and sales positions with Mellon Bank from 1979 to 1992. Outside his role with M&T Bank, Bojdak is a Board Member of The Buffalo Fine Arts Academy. Bojdak received a Bachelor of Science in Business Administration from Georgetown University, and a Master of Business Administration (MBA) from the University of Michigan. Equal Housing Lender. © 2019 M&T Bank. Member FDIC. All rights reserved.